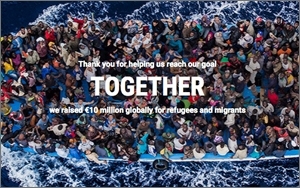 Google, TripAdvisor Ask Consumers To Help Refugees; Will Other U.S. Brands Follow? While the surging tide of refugees entering Europe has riveted the world’s attention, most U.S. companies are keeping their distance — at least in ways that might catch a consumer’s eye. Google is one high-profile exception, raising more than $11 million in its matching-donation campaign, and TripAdvisor another. But more companies are simply making quiet philanthropic gifts. And the recent spot pleading for contributions to the World Food Programme didn’t reveal the names of any of its backers, a list that includes McDonald’s, Burger King, Facebook, Google, MasterCard and United Airlines. So in an era when just about every earthquake, hurricane or tsunami triggers an overnight cascade of hashtagged brand-linked fund-raising, what gives? Part of the reluctance is geography: It’s a crisis happening on the doorsteps of countries many Americans couldn’t even find on a map. Part of it is a growing national ambivalence about outsiders, with American’s anti-Muslim sentiment growing and our own migrant problems dominating election debates. It all adds up to a tepid cup of compassion: A recent CNN/ORC poll finds that while overall, 55% of Americans believe the U.S. has a responsibility to help, the divide along party lines is sharp. Most Republicans oppose the idea, and most Democrats support it. That’s not to say some haven’t been generous, making large contributions to relief organizations, including Save the Children, International Relief, UNHCR, and Doctors Without Borders. (Except for Google, Silicon Valley seems unmoved, reports the Washington Post.) But so far, activity is almost entirely philanthropic, rather than cause-related or even consumer facing. Safirstein thinks more brands will join in such efforts, as media coverage continues to build, and conversations about how to help become more mainstream, in the U.S.